1. 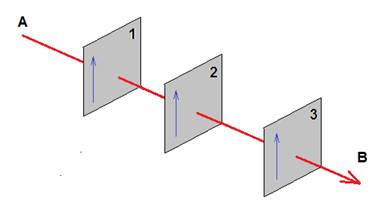 A parallel beam of unpolarised light is transmitted through the polarisers shown below.The light has a power of 2mW and the diameter of the beam is 4mm.Calculate the Intensity of the beama. at Ab. Bc. at B if 2 is rotated through 45°d. at B if 3 is now rotated through 90°e. at B if 2 is now removed.